2. 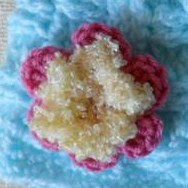 I used an I ( 5.5 mm) hook and JoAnn Sensations Rainbow Boucle and Red Heart Super Saver for the flower in the photo. Round 1: Ch 1, *sc in the ring, ch 3. Repeat from * five times. Join with a slipstitch in the first sc. Round 2: Slipstitch in ch 3 space, ch 1, sc, ch 1, 3 dc, ch 1, sc. *Sc, ch 1, 3 dc, ch 1, sc in next ch 3 space. Repeat from * four times. Join with a slipstitch in the first sc. Fasten off leaving a tail long enough to sew flower to item. Attach yarn with a sc in any sp between petals. (Ch 3, sc in side of sc, ch 3, sc in same sp). * Ch 3, sc in next sp, (ch 3, sc in side of sc, ch 3, sc in same sp). Repeat from * around. End with ch 3, fasten off and use the tapestry needle to join in the first sc.